Microsoft has invested years of development and acquisition into sustaining their lead in the small to middle ERP products market. The result of this investment is Dynamics GP, which has one of the largest sets of reporting tools, out-of-the-box functionality, and scalability of any ERP software product on the marketplace today. There are many reasons to use Microsoft Dynamics GP as your ERP solution. In this blog, I will continue to highlight what I believe are the top reasons why you should implement Microsoft Dynamics GP. If you missed our first 3 reasons check our previous post here. Along with all the base functionalities of Dynamics GP, there is also a multitude of reporting options available to users. Everyone knows these days that the ability to view your Data in Microsoft Excel is what most people want from their reports. Excel allows you to take that ‘raw’ data and manipulate it even further using the powerful features of Microsoft Excel. SmartList is what I call the “Users’ Reporting Tool” of Dynamics GP. SmartList focuses less on the formatting and primarily allows users to view raw ERP data or to export to Excel for further manipulation. This feature comes with default “SmartLists” which are out-of-the-box reports that a user can take advantage of without being required to make changes. These reports are categorized into 2 styles: Master File Records and Transactional Records. Anything you may need in Excel for either style is available for export. This includes Accounts, Vendors, Customers, Fixed Assets, Inventory Items, Receivables and Sales Transactions, and more. SmartList reports are customizable, allowing users to add, remove, or rename columns as well as add up to 4 filters to narrow down data if needed. If you want to have SmartLists with both master file info and related transactions, a user can use the ‘SmartList Designer’ reporting tool to create their own reports. The awesome part of these reports is your data is already in a row/column format, you simply click the ‘Excel’ button and BOOM! Your data is now in Excel, ready for further designing. UPDATE: With SmartList Designer you can also create refreshable Excel Reports. See below for more of what this means. What if you want your ERP data directly in Excel without the need to go into Dynamics GP? Then Excel-Based Reports are exactly what you need! Excel-Based reports only require you to format the data the first time. From then on, these types of reports will retain the selected formatting, even if you want to ‘refresh’ or use the most current data in your report. Note: Dynamics GP has almost 200 of these reports deployed so it’s quite an arsenal of reports to start with! Similar to Excel Based Reports, Dynamics GP has also almost 200 SSRS reports which are built by utilizing the SQL server. The nice thing about SSRS reports is that the one running them does not have to be in Dynamics GP. SSRS Reports can also have different formatting layouts, such as tabular or graphical. These reports can be accessed directly from your company’s network through a browser and you can set up a ‘catalog’ of reports to be available for generating. Like Excel-Based reports, you can click the ‘refresh’ button and the information will be ‘live’ and up to date. Another great feature of SSRS reports is they can be exported to Excel, or saved as a PDF, CSV file, or even an HTML or XML file for publishing on a browser. 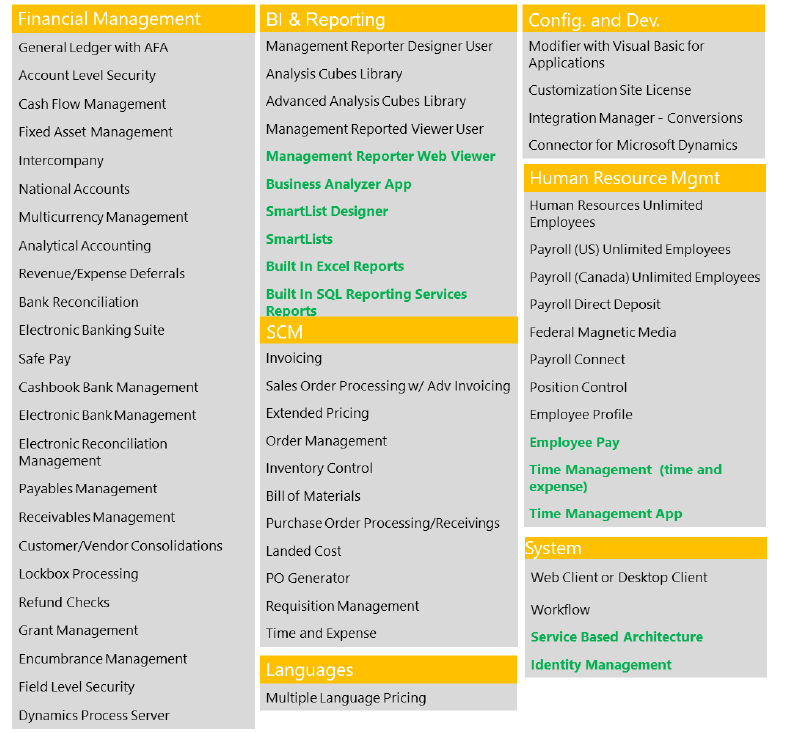 Remember, all these features are included with Dynamics GP out of the box (and you can create your own reports too)! The real staying power behind Microsoft Dynamics GP has to be the ‘scalability’ of the product. With GP, you can start with a few users running a single company and never change for years, but this is not the reality for most companies. Companies are ever growing and ever evolving and the ability to save hundreds of thousands of dollars by avoiding implementation of another ERP system for as long as possible is what really makes Dynamics GP stand out from the crowd. The key to running Dynamics GP on such a large scale is utilizing the awesome power of Microsoft SQL Server. Microsoft Dynamics GP even has its own whitepaper on running Dynamics GP on SQL Server with 1000 users that you can check out here. When a product has been around for over 2 decades, there are a lot of features you can add that builds on what you’ve had from the beginning! The goal of Dynamics GP is not to develop a be all/end all of features for users, but to keep building on the core accounting features it already supports. GP also leverages the power of its Microsoft Office products. In addition to the extensive functionality in financials and distribution, the big wins here are Intercompany, Multicurrency, BI/Reporting tools and Payroll (unlimited employees). Such a huge amount of functionality for $5K USD starting with 3 users! Whether you value robust reporting tools, scalability for your growing business, or the diverse out-of-the-box functionality during your selection process for a new ERP system, I believe Dynamics GP is one of the best if not the best option. If you’d like to learn more about Dynamics GP or have any questions, feel free to reach out to FMT Consultants, LLC using the form below.